On the War2PPatcher has option to change Iron Man threshold from 1200 to 0 but It still won't let me host with it. Everything else seems to work like changing speed to EF and resources. We really should try to do more with the Iron Man as it's something that has been worked on already it seems. Maybe get it to where we can 2vs2 Iron Man? You need 1200 from ladder to play Iron Man ladder! I think it is possible to do without though. @iL has been playing a lot of Warcraft 2 lately, maybe adding Iron Man options is something he is up to working on? 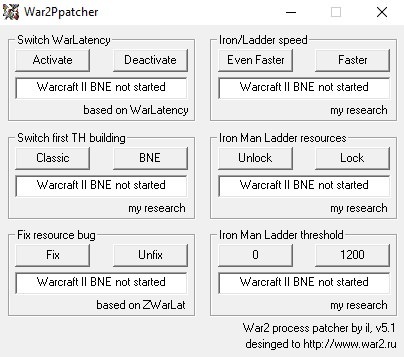 war2patcher used to work. apparently it doesn't anymore. u have 1200 from ladder? A 2v2 iron man system would be awesome! nobody would use it tho. id love it but i would never find anyone to play it with. Some of the things on it are working. No im to bad i got only 1000 u got? At 0 threshold we could even try Iron Man tournament. Was the fixed order bug fixed on Combat too? Was thinking it was maybe you know.